How is a broken radial head treated? Most radial head fractures are treated by putting your arm in a sling to rest it while it heals. But sometimes a complex break may need surgery. how good your overall health is. If the break is unstable, the bone has shattered into many pieces, or the break includes the joint surface, you may need surgery to put the pieces back into the right place and hold them there until you heal. Whether you need surgery or not, you will probably need time off work while you heal. How can I help my arm to heal? There are some things that you can do to help your recovery if you don't need surgery. If you are a smoker, stop smoking, as continuing to smoke may slow down your healing. Avoid any heavy lifting, as this will only increase your pain and slow your recovery. Take regular pain relief. The best pain relief is paracetamol (Panadol) or paracetamol and codeine (Panadeine). Take two tablets every four hours, but take no more than eight tablets a day. Avoid anti-inflammatories, as they may slow down how quickly your bones heal. Try to reduce any swelling, as the more swollen your elbow is, the more painful it will be. 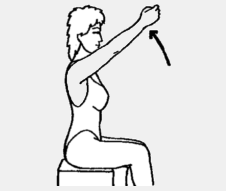 Keep your elbow raised (elevated) above the level of your heart whenever possible. Also apply ice (wrapped in a towel or plastic bag) to your elbow, for 20 minutes at a time, every two to four hours. Don't put ice directly on your skin, as this can burn it. 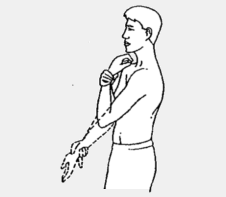 When your doctor or surgeon tells you it's OK (usually a week or two after your injury) take your arm out of the sling two to three times a day to do these exercises. Aim to do each exercise 10 times. 1. To reduce swelling, clench your hand and release your fist. 2. Raise your arm above your head. 3. Bend and straighten your elbow. 4. 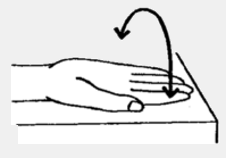 Turn your palm up and down, keeping your elbow still.